Background Physical exercise is seen as a promising intervention to prevent or delay cognitive decline in individuals aged 50 years and older, yet the evidence from reviews is not conclusive. Objectives To determine if physical exercise is effective in improving cognitive function in this population. Design Systematic review with multilevel meta-analysis. Data sources Electronic databases Medline (PubMed), EMBASE (Scopus), PsychINFO and CENTRAL (Cochrane) from inception to November 2016. Eligibility criteria Randomised controlled trials of physical exercise interventions in community-dwelling adults older than 50 years, with an outcome measure of cognitive function. Results The search returned 12 820 records, of which 39 studies were included in the systematic review. Analysis of 333 dependent effect sizes from 36 studies showed that physical exercise improved cognitive function (0.29; 95% CI 0.17 to 0.41; p<0.01). Interventions of aerobic exercise, resistance training, multicomponent training and tai chi, all had significant point estimates. When exercise prescription was examined, a duration of 45–60 min per session and at least moderate intensity, were associated with benefits to cognition. The results of the meta-analysis were consistent and independent of the cognitive domain tested or the cognitive status of the participants. Conclusions Physical exercise improved cognitive function in the over 50s, regardless of the cognitive status of participants. To improve cognitive function, this meta-analysis provides clinicians with evidence to recommend that patients obtain both aerobic and resistance exercise of at least moderate intensity on as many days of the week as feasible, in line with current exercise guidelines. Physical exercise shows promise as a modifiable risk factor to reduce the risk of dementia and related neurodegenerative diseases.1 As cognitive function declines with advancing age, a physically active lifestyle has an important role in reducing such declines,2 3 as well as the incidence of dementia.4 It is hypothesised that the neural and vascular adaptations to physical exercise improve cognitive function through promotion of neurogenesis, angiogenesis, synaptic plasticity, decreased proinflammatory processes and reduced cellular damage due to oxidative stress.5 While lifelong participation in physical exercise may be preferable, the adoption of exercise at any age to delay or reverse cognitive decline is worthwhile given the prevalence of physical inactivity and the increasing proportion of older adults in the population. Although early meta-analyses, such as a study of aerobic exercise interventions,6 showed large benefits to cognitive function in older adults, more recent systematic reviews7 and meta-analytical studies8–10 are much less conclusive. For example, a recent meta-analysis of aerobic, resistance training and tai chi interventions in people older than 50 showed little benefit of exercise on cognitive function.9 The discrepancy in findings is partly because existing reviews are excessively restrictive in their inclusion criteria, often considering only one mode of exercise (eg, recent reviews of aerobic training only10 11) or a narrow range of publication years. Thus, the numerous meta-analyses published provide incomplete summaries of the available evidence in people aged 50 and over. Studies which prescribe a combination of both aerobic and resistance training components in one intervention (here on called multicomponent training) have not been reviewed in healthy older adults since the 2001 study of Colcombe and Kramer6 despite global guidelines recommending this type of training in older adults.12 13 Alternative modes of exercise such as yoga14 or tai chi15 may also be beneficial to cognitive function, yet randomised controlled trials (RCTs) of these modes in older adults have not been specifically reviewed. Importantly, prior reviews offer relatively little information about the optimal prescription of physical exercise for cognitive health. Physical exercise provides a complex stimulus for adaptation in the body and its dosage can be modulated by various parameters, including duration, frequency, intensity and the mode or type of exercise. Despite this, many reviews do not take into account the importance of exercise prescription variables in either the analysis or discussion of the literature. Consequently, there is an urgent need for guidelines on the type or amount of exercise a clinician should recommend to their patient. To deal with these research gaps, we have completed a comprehensive meta-analysis which includes a larger number of studies by imposing no limit on publication date or exercise mode. This study examines four key issues including: (1) the effects of supervised exercise interventions of aerobic, resistance, multicomponent, tai chi and yoga training modes on cognitive function; (2) the influence of exercise training variables, including the duration, frequency, intensity and length of exercise; (3) the differentiation of exercise effects on global cognition and domains of cognition, including attention, executive function, memory working memory; and (4) the impact of study design, including the nature of the control group and the baseline cognitive status of participants. To direct the design of the search strategy, previously completed meta-analyses6–9 were reviewed and search terms were piloted to ensure a comprehensive identification of potential articles for inclusion in the systematic review. 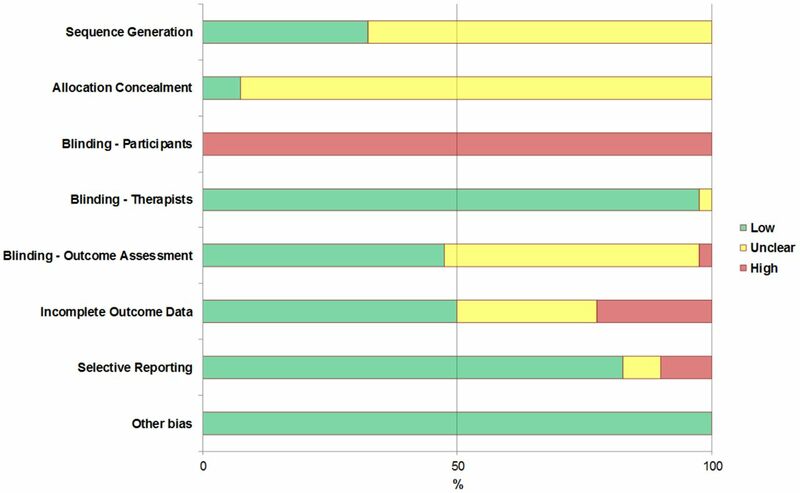 A computer search of Medline (PubMed), EMBASE (Scopus), PsychINFO and CENTRAL (Cochrane Central Register of Controlled Trials) was then conducted up to November 2016, using medical subject headings (MeSH) for ‘exercise’ and ‘cognition’ (box 1). ‘Exercise’ and ‘cognition’ search terms were combined with ‘AND’ and searched in ‘All Fields’ with the limits human and English language (see online supplementary table A). All returned titles were screened by the first author (JMN) to exclude duplicate or clearly non-relevant studies. The abstract of each remaining study was then independently reviewed by JMN and BR. The preceding stages were overinclusive. Subsequently, the full texts of the remaining studies were independently reviewed by JMN, KLP and DJS against the inclusion and exclusion criteria. Disagreements were discussed and consensus reached among the authors in all cases. Review authors subsequently searched the bibliography of included articles and prior reviews to ensure that relevant articles had been captured by the search strategy. All studies in the systematic review were eligible for inclusion in the meta-analysis. Studies were included from the initial search if they strictly met the following criteria: (1) studies of community dwelling men or women aged 50 years or older. Because criteria for diagnosing cognitive ability (eg, the presence of mild cognitive impairment (MCI)) differ between studies and prior reviews,8 there were no limitations on baseline cognitive status. However, studies which included clinical samples with other neurological (eg, stroke) or mental illnesses (eg, depression) were excluded. (2) A structured exercise programme of any mode, duration, frequency or intensity. Exercise programmes that were not explicitly stated as fully supervised, or of <4 weeks, were excluded. Studies must have allowed the isolated effects of exercise to be measured. (3) A control group could include no contact, waiting list, attention control, sham exercise or alternative active treatment. (4) At least one outcome measure of cognition, measured at baseline and follow-up by any validated neuropsychological test of cognition. (5) The study design was strictly limited to RCTs. (6) A trial must have been published in a peer-reviewed journal. Data on the study population, intervention, control group and outcome measures were independently extracted into a standardised form by two review authors (JMN and DJS). Where available, the mean change from baseline, the SD of the mean change and the number of participants at each assessment for all groups were extracted. Where authors reported more than one measured time-point throughout an intervention, only the longest follow-up period in which the exercise intervention was continued was admitted. Data were extracted such that an improvement in performance was coded as a positive change score. Variance information was converted to SD. Where the mean change from baseline was not available, it was calculated from baseline and postintervention cognition scores. Similarly, where change from baseline SD was not available, it was calculated from baseline SD and postintervention SD using the formula: SDchange=√(SD2 baseline+SD2 postintervention)–(2×Corr×SD2 baseline×SD2 postintervention), where Corr=0.5. The value for Corr was imputed on the assumption of a moderate correlation between baseline and postintervention measures. While this may overestimate the change from baseline SD, it represents a conservative approach that is consistent with previous meta-analyses.8 Sensitivity analysis was performed to assess the impact of including SDs calculated from the imputed Corr value. Unpublished data (mean and SD) were requested from the authors of four studies,17–20 and clarification of published data was requested from the author of one study.21 Subsequently, unpublished data from Langlois et al 18 and Tsai et al 20 were included in the quantitative assessment. Descriptive data from each study were coded for inclusion in the moderator analysis (described later). In accordance with objective 2 of the review, the characteristics of the physical exercise intervention were coded into categorical variables. First, the mode of exercise was classified as aerobic, resistance training, multicomponent training (an intervention with both aerobic and resistance training components), tai chi or yoga. Exercise intensity (low; moderate; high) was coded in reference to published guidelines that reconcile differences in the terminology used to describe exercise intensity.22 23 The duration (minutes each session lasted, including any warm-up or cool-down) and length (weeks of exercise: short: 4–12 weeks; medium: 13–26 weeks; long: >26 weeks) of the training period in the exercise and control groups were coded using a prior review as a guide.6 The coding for duration (short: ≤45 min; medium: >45 to ≤60 min; long: >60 min) was modified from Colcombe and Kramer,6 who defined a ‘short’ duration as ≤30 min. The current review modified this cut-off point as it did not include any studies which prescribed exercise for ≤30 min, possibly owing to differences in the inclusion criteria. In addition, the frequency (number of exercise sessions per week: low: ≤2; medium: 3–4; high: 5–7) of both groups was coded. Two authors (JMN and DJS) independently assessed the risk of bias at the study level of included RCTs in accordance with the Cochrane Collaboration Guidelines.25 The risk of bias was assessed as being ‘low’, ‘high’ or ‘unclear’ across the following domains: randomisation; allocation concealment; blinding of therapists (intervention supervisors); blinding of participants; blinding of outcome assessors; handling of incomplete data (use of intention-to-treat analysis); selective reporting and any other risk of bias. Discrepancies in the risk of bias assessment were resolved by discussion among review authors. The GRADE guidelines33 were applied independently by two review authors (JMN and DJS) to evaluate the overall quality of evidence for the comparison of exercise versus control groups for cognitive function. The overall quality of evidence was initially considered ‘high’ owing to the inclusion criteria, which stipulated that studies must be a RCT. The quality of evidence was downgraded by one level where each of the following four factors applied: (1) high risk of study bias; (2) inconsistency evaluated by a substantial I2 (>75%). I2 was calculated with the following formula: I2(%)=(Q−df)/Q)×100; (3) imprecision due to fewer than 400 participants in the outcome and (4) publication bias identified through an evaluation of funnel plot asymmetry. Indirectness was not considered owing to the inclusion criteria of the review. The flow of records through the review is summarised in figure 1. The initial search strategy returned 12 820 records, of which 215 were retrieved for full-text review. Forty-three articles met the criteria for inclusion in the qualitative analysis. The analysis was conducted on each study. Subsequently, on four occasions when a study produced more than one publication (Blumenthal et al 34 and Madden et al 35; Liu-Ambrose et al 36 and Liu-Ambrose et al 37; Nagamatsu et al 38 and ten Brinke et al 39; and Erickson et al 40 and Voss et al 41), they were considered as one study for analysis. Finally, 39 studies were included in the qualitative analysis, with all studies eligible for inclusion in the quantitative analysis. The exercise mode was used to group the studies into interventions of aerobic exercise (k=18),17 19 34 35 38–52 resistance training (k=13),20 21 36–39 47 53–59 multicomponent training (k=10),18 57 60–66 tai chi (k=4)46 67–69 and yoga (k=2).34 70 The methodological characteristics of these studies are summarised and available in supplementary table B.
PRISMA (Preferred Reporting Items for Systematic Reviews and Meta-Analysis) flow diagram of each stage of the study selection. RCT, randomised controlled trial. The risk of bias assessment is summarised in figure 2. The majority of studies did not describe the process of sequence generation or allocation concealment in sufficient detail and were judged as having ‘unclear’ risk of bias for these domains. In all of the assessed studies it was neither practical nor possible to blind the participants and therapists. It was judged that this presented a low risk of bias for the therapists but a high risk of bias for the participants. Studies were judged to have a high risk of bias for incomplete outcome data if they did not employ intention-to-treat principles in the data analysis or did not account for drop outs. All other domains were judged to have a low to unclear risk of bias. Analysis of the risk of bias in included studies in accordance with the Cochrane Collaboration guidelines. 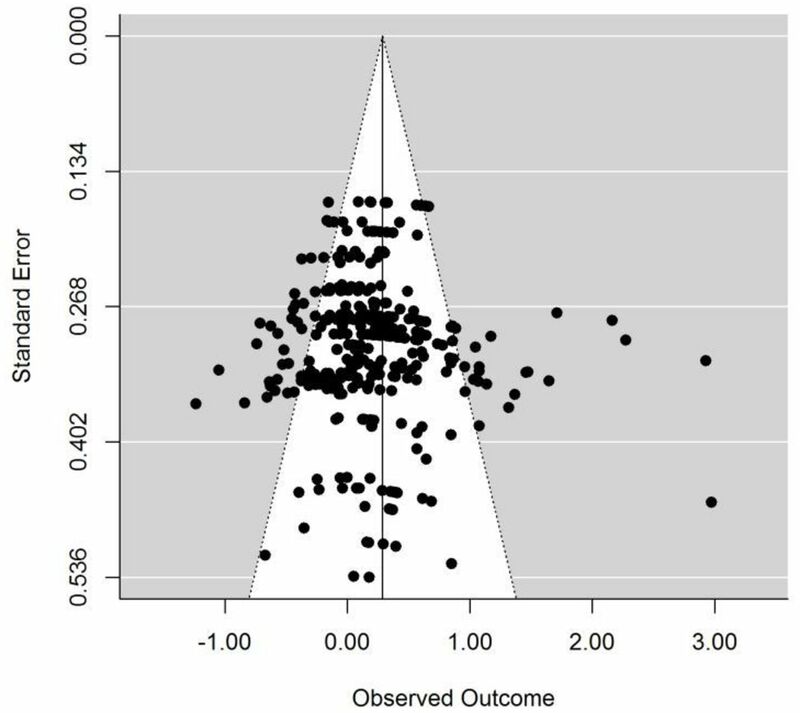 The multilevel meta-analysis provides an estimate of the difference between physical exercise and control on cognitive function for 333 dependent effect sizes across 36 studies. The SMD was 0.29 (95% CI 0.17 to 0.41; p<0.01) and there was significant heterogeneity present (Q332=811.00; p<0.01). The funnel plot of included studies is presented in figure 3. Visual inspection of the funnel plot and a non-significant Egger’s regression intercept (p=0.175) suggests the absence of funnel plot asymmetry. Funnel plot of included dependent effect sizes (k=333). According to the GRADE guidelines, the evidence for this outcome was classified as moderate quality. The evidence was conservatively downgraded owing to the level of uncertainty across each domain of the risk of bias tool (figure 3). To investigate potential sources of variance, moderators were analysed one at a time in separate models. The results from this stage of analysis are summarised in table 1 and described below. When exercise mode was examined as a moderator, all modes of exercise produced significant (p<0.01) and positive effect estimates, except for yoga (p=0.27). Studies where the duration of exercise was medium (>45 min to ≤60 min; p<0.01) were associated with significant estimates in comparison with short- and long-duration exercise, which were not statistically significant. Moderate (p=0.02) and vigorous (p<0.01) intensities had similar sized effect estimates, whereas low intensity was not significant (p=0.11). The frequency and length of the exercise intervention produced significant estimates across all three categories. For each exercise moderator analysis, the omnibus test was significant and the 95% CI for each factor overlapped. The effect of exercise on cognition was statistically significant for all domains, except global cognition. As prior reviews have indicated the effects of exercise on cognition may vary depending on the mode of exercise and cognitive domain, we included both these moderators as an interaction term in a separate model. Studies of resistance training had significant interaction effects on executive function (SMD=0.49, 95% CI 0.20 to 0.78; p<0.01), memory (SMD=0.54, 95% CI 0.23 to 0.85; p<0.01) and working memory (SMD=0.49, 95% CI 0.16 to 0.82; p<0.01). There was also a significant tai chi x working memory interaction (SMD=−0.70, 95% CI −1.21 to −0.19; p=0.01). All other interaction terms were non-significant. This study conducted the most comprehensive systematic review of RCTs in adults >50 years of age to date. Importantly, it did not limit the inclusion of studies by exercise mode or publication date and incorporated a multilevel meta-analysis method that included exploration of moderator variables and formal assessment of small-study effects. The key finding from this study is that physical exercise interventions are effective in improving cognitive function in adults aged >50 years, regardless of cognitive status. Of the traditional modes of exercise, studies incorporating a component of aerobic or resistance training showed similar effect size estimates. Aerobic exercise has previously been associated with large improvements in complex cognitive tasks such as executive function.6 Although the size of the effect estimates reported here is smaller than reported by Colcombe et al,6 our study also suggests that aerobic exercise is beneficial to the cognitive functioning of older adults. This finding is of importance as the results of more recent reviews8–10 collectively provided little evidence of aerobic training benefits and contradicted exercise recommendations for this age group. An important feature differentiating this study from more recent reviews of aerobic exercise is the multilevel analysis model used and the absence of restrictions on publication date. As a result of these differences, this review was able to conduct a robust investigation, with greater statistical power and included a large number of otherwise relevant studies not eligible for these recent reviews. This study confirms previous suggestions that resistance training may play an important role in improving cognitive function in older adults.8 The moderator analysis showed significant interaction effects for resistance training with executive function, memory and working memory. Although this does not show that resistance training is better than other modes of exercise, it does suggest that this type of training has particularly pronounced effects on these domains of cognitive function. In contrast to our results, a previous meta-analysis which tested the effect of resistance training found no benefit to cognition in older adults.9 However, our review contained a greater number of resistance training trials than the previous meta-analysis9 by including studies published before 200247 56 and those published since their census date in 2012.37–39 57–59 Although prior reviews showed that the addition of resistance training to an aerobic intervention may have additional benefits to cognition compared with aerobic exercise alone,6 24 this is the first review to specifically investigate the effect of multicomponent training on cognitive function in this age group. As exercise guidelines for this age group recommend obtaining both aerobic exercise and resistance training to improve health and reduce the risk of disease,12 13 it was important for this type of intervention to be reviewed for its effect on cognition. Our meta-analysis provides positive evidence for the prescription of both aerobic and resistance training (ie, multicomponent training), in accordance with exercise recommendations, for this age group to specifically improve cognitive functions. Our meta-analysis also showed that tai chi improved cognitive function in this age group, as suggested in previous studies.15 However, this finding should be considered in the context of the small number of tai chi studies included in this review. Further evidence is required from large well-designed RCTs to confirm this effect. Nevertheless, it is an important finding because non-traditional modes of exercise, such as tai chi, may be suitable for less functional populations. An important objective of this review was to investigate the role of physical exercise training principles on changes in cognitive function. The moderator analysis in this study showed that exercise of between 45 and 60 min in duration, of moderate or vigorous intensity and of any frequency or length is beneficial to cognitive function. Although the moderator analysis suggested statistical differences in the effect estimates between levels of each moderator, the overlapping 95% CIs made it difficult to discern the practical significance of these differences. While there are statistical methods to identify these differences (namely pairwise comparisons), there is a risk of inflated type I errors and the possibility of false-positive or false-negative results with the application of correction factors. As this review provides evidence of the beneficial effect of physical exercise on cognitive function, future RCTs must instead move beyond investigating effectiveness and begin to refine the prescription of training to promote the greatest benefits to cognitive function. Several trial design characteristics were investigated as moderating factors. First, the presence of MCI in study participants did not change the overall findings of the meta-analysis. This is important owing to the increased risk of transitioning to a diagnosis of Alzheimer’ s disease or dementia with the presence of MCI.72 Although higher levels of physical activity are associated with reduced disease progression in MCI,73 it is important to know how exercise interventions delay or reverse cognitive decline in a population where activity levels may be low. Previous meta-analyses have shown both negligible8 and positive11 effects on cognitive function in populations with MCI. Although it is not clear whether exercise is more or less effective in cognitively impaired or intact patients, the results of our analysis provide additional evidence that physical exercise has a positive effect on cognitive function in patients with MCI. Second, when the control group used no contact (eg, usual care, waiting list) or an education programme (eg, health lectures, computer course), the effect estimates were all significantly beneficial in comparison with either an active or social control. This finding is of interest as it suggests that education alone is not sufficient to promote changes in lifestyle habits which can be of measurable benefit in the short term. A major strength of this study is that it provides an up-to-date summary of supervised RCTs of physical exercise for cognitive function in adults aged >50 years and advances previous and recent reviews by employing a multilevel design and not limiting exercise mode or publication date. Despite this, the findings of the review must be considered in the context of a number of limitations. First, the search strategy was limited to English language publications and thus there is a possibility of a language bias in the systematic review. Second, studies were included only if exercise was the sole intervention. Consequently, a large number of studies which used exercise as an adjunct component to another intervention (eg, combined cognitive and physical exercise; see Law et al 74) were excluded. As the objectives of this review were to examine the effect of physical exercise, it was not appropriate to include such studies. Additionally, the RCTs included here were strictly limited to fully supervised exercise interventions. This inclusion criterion was implemented as it is important to acknowledge the methodological and conceptual differences between a supervised and unsupervised intervention. From a public health perspective, however, the effect of unsupervised exercise or a comparison between supervised and unsupervised exercise interventions would be of great value. Future meta-analyses designed to specifically answer this question are required. 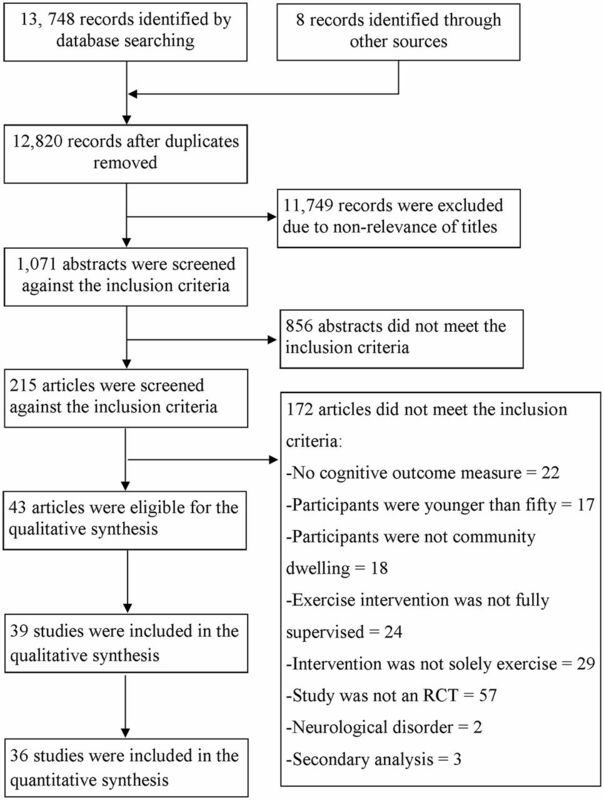 This meta-analysis showed that physical exercise interventions are effective at improving the cognitive function of older adults, regardless of baseline cognitive status. Interventions of aerobic, resistance training, multicomponent training and tai chi were similarly effective. The findings suggest that an exercise programme with components of both aerobic and resistance-type training, of at least moderate intensity and at least 45 min per session, on as many days of the week as possible, is beneficial to cognitive function in adults aged >50 years. Physical exercise interventions significantly improved cognitive function in adults older than 50 years, regardless of baseline cognitive status. When exercise training variables were considered, interventions that included exercise with a minimum duration of 45 min and at moderate to vigorous intensity showed improvements to cognitive function. This meta-analysis provides positive evidence that a combination of aerobic and resistance type exercise of at least moderate intensity on as many days of the week as feasible is beneficial to cognitive function. Tai chi may be a promising intervention aimed at brain health for the over 50s, although further high quality randomised controlled trials are required to confirm the benefits shown in this study. The dosage of physical exercise is important and clinicians should ensure their exercise recommendations are individualised and provide a sufficient training stimulus.
. Physical activity and brain plasticity in late adulthood. Dialogues Clin Neurosci 2013;15:99–108.
. Aerobic exercise to improve cognitive function in older people without known cognitive impairment. Cochrane Database Syst Rev 2015;4:CD005381. WHO. Global recommendations on physical activity for health. Geneva: World Health Organization, 2010.
. Effect of six weeks of endurance exercise and following detraining on serum brain derived neurotrophic factor and memory performance in middle aged males with metabolic syndrome. J Sports Med Phys Fitness 2013;53:437–43. ACSM. ACSM’s guidelines for exercise testing and prescription: Lippincott Williams & Wilkins, 2013.
, The Cochrane Collaboration. Cochrane handbook for systematic reviews of interventions. NY: John Wiley & Sons, 2011. R Core Team. R: a language and environment for statistical computing. Vienna, Austria: R foundation for statistical computing, 2012. ISBN 3-900051-07-0, 2014.
. Effects of resistance training exercise on cognitive performance in elderly individuals with memory impairment: results of a controlled trial. Einstein 2008;6:402–7. Acknowledgements The authors report no disclosures. NC is funded by an ARC Future Fellowship No 120100227. The authors thank Dr Marijke Welvaert for advising on the statistical methodology. Contributors JMN contributed to the design of the study, the literature search, data screening and extraction, conducted all statistical analyses, and managed all aspects of manuscript preparation and submission. He is guarantor. NC contributed to the design of the study, provided methodological input and theoretical expertise, and contributed to writing and editing of the manuscript. KLP contributed to the design of the study, data screening and extraction, and contributed to writing and editing of the manuscript. DJS contributed to the design of the study, data screening and extraction, and contributed to writing and editing of the manuscript. BR contributed to the design of the study, data screening and extraction, provided methodological input and theoretical expertise, and contributed to writing and editing of the manuscript. All authors meet the criteria for authorship and JM Northey accepts to provide access to the data on request.